Reliving Mankind’s Finest Hour | Be Responsible – Be Free! I’m leaving Libertarianism aside today, to show you what I regard as the greatest YouTube clip I’ve ever seen. Astronaut Neil Armstrong, commander of the Apollo 11 mission and the first man to walk on the moon, testified before a hearing of the House Science, Space and Technology Committee on 22 September 2011; the YouTube clip is a capture of the web stream broadcast. I was alerted to it by this story in today’s News Limited’s technology page. I was six years old (and obsessed with the Apollo 11 mission) when Armstrong and co-pilot Buzz Aldrin stepped onto the surface of the moon. Forty-two years later, to listen to this elderly gentleman as he puts us in the driver’s seat of the lunar landing module, and watch as we join him on his final, white-knuckle descent to the surface using Google Moon, with fuel running low and desperately searching for a smooth landing place, is something I intend to relive many times over. I’m proud that my own country played a pivotal rôle in relaying mission communications, including the famous television pictures of Armstrong descending the ladder to the surface. For my money, though, the overlay of Armstrong’s own narration makes the clip at the top a must-see. When the lunar landing module touches the surface, and we hear the tape of Armstrong’s words, “Tranquility Base here – the Eagle has landed”, you can hear the assembled congressmen out of camera shot burst into spontaneous applause and cheers. After all this time. Incredible. 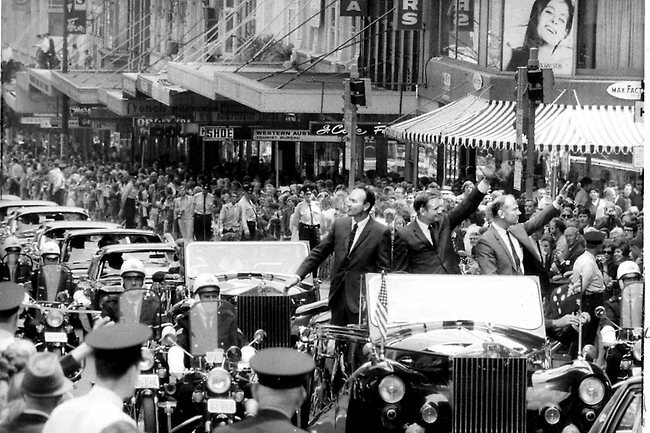 You can also see a much more relaxed Armstrong speaking with CPA Australia president Alex Halley about those days, with the same higher-quality visuals here. Update 26 Aug 2012 0930: Vale Neil Armstrong, who passed away yesterday following complications from recent heart surgery. He was 82. A moment in time to savour. It were all faked in a Hollywood studio. 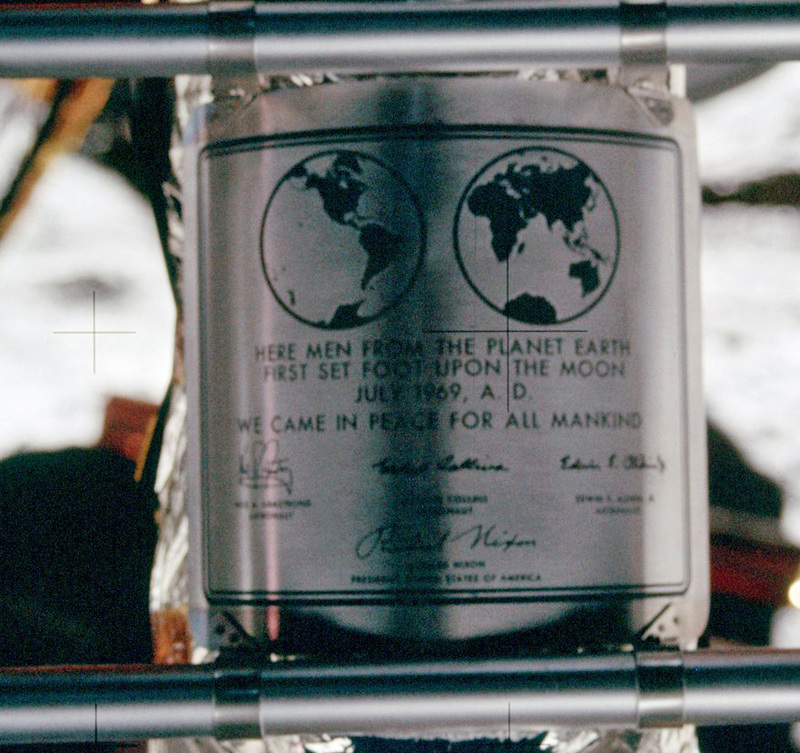 I share your respect for the achievements of the Apollo lunar missions. If any sort of human civilisation survives for another few centuries I don’t think there is much doubt about what historical events will be remembered from this time. Cook, Magellan, Columbus are the names we all know from the past, half a millennia and Armstrong and Gagarin will be among them. What is also a shock is the primitive electrics, the Sinclair spectrum computer I had was far more sophisticated than any equipment in the LDM! I doubt you can convince a moon landing conspiracy theorist even with the hardest of hard evidence apparent to their own eyes. When faced with a contradiction between our beliefs and hard evidence, most people will first dismiss any and all evidence. It takes quite an exercise in mental discipline to accept that our subjective beliefs are not always right. Unfortunately we always assume that any idea we hold is absolutely correct; its an inherent mental function thatu prevents us from doubting our beliefs without a lot of practise! The 60s were an amazing decade. We went from Alan Shepard’s brief, non-orbital flight into space in 1961 to landing Armstrong and Aldrin on the moon in 1969. In the intervening years we not only caught up to the Soviets but blew right past them. I recall being 12 years old and sitting utterly transfixed in front of our Westinghouse B&W TV watching the moon landing. Even at 12 I realized I was witnessing something of incredible historical significance. The 60s were a tumultuous decade. I remember the Beatles appearing on the Ed Sullivan show, the Vietnam war on TV every evening, the assassinations of JFK, MLK and RFK. There was a huge evolution in music ad the birth of the hippie counter-culture. It was a wild ride…but so were the early 70s. It was still faked you can see one of the cameramen reflected in Buzz Aldrin’s helmet. Dr Dave was also faked and Izen as well. All right, I admit it: I’m Izen. I invented him to churn up a bit of controversy at LibertyGibbert. I do remember watching the second and other landings but alas my memory does not remember the first one. I must admit the whole moon landing thing was pretty cool then of course a Dem congress cancelled the lot, it is noticeable yet another Dem cancelled the Orion project see picture above. We woke our kids up so they could see the Moon Landing on the TV. They were 4 & 3. Fat lot of good that did, they don’t remember it at all!! We thought they ought to be there at such a momentous moment. I always wanted to know what happened to the dog, when they said the Beagle had landed. Harrison Schmitt was the only honest to goodness scientist ever to walk on the moon. He has a Ph.D. in geology from Harvard. He flew on the Apollo 17 mission and was the second to last man to set foot on the moon (Gene Cernan got in the capsule after Scmitt). A staunch pragmatist and fiscal conservative, the state of New Mexico was fortunate to have him as our senator from the late 70s to the early 80s. Sadly he lost reelection to a douche bag named Jeff Bingaman whose campaign slogan was “Harrison Scmitt…what on Earth has he done for you lately?” Promising New Mexicans more pork from the federal government is a sure path to election even if it was a death knell for the nation. But those were the Reagan years and times were good. Bingaman did everything right for several years. He funneled money into our two national labs. But in recent years he has become a rabid advocate for alternative energy and has pushed for mandated use of alternative energy not just on a state level but on a national level. Thankfully he is retiring at the end of this term. There is a woman who is a former USAF Captain and a former 1st District US Representative who is running for the seat. She has my support..
As far as I know only Ohio (John Glenn) and New Mexico (Harrison Schmitt) have ever had former astronauts as Senators. One of the Apollo 13 astronauts ran for and won a House seat in Colorado but died of cancer before he could take office. Astronauts are not like lawyers. They are highly trained and highly disciplined individuals. We currently have 3 physicians serving in the Senate (all Republicans). I think we could use a few more astronauts and a lot fewer lawyers. 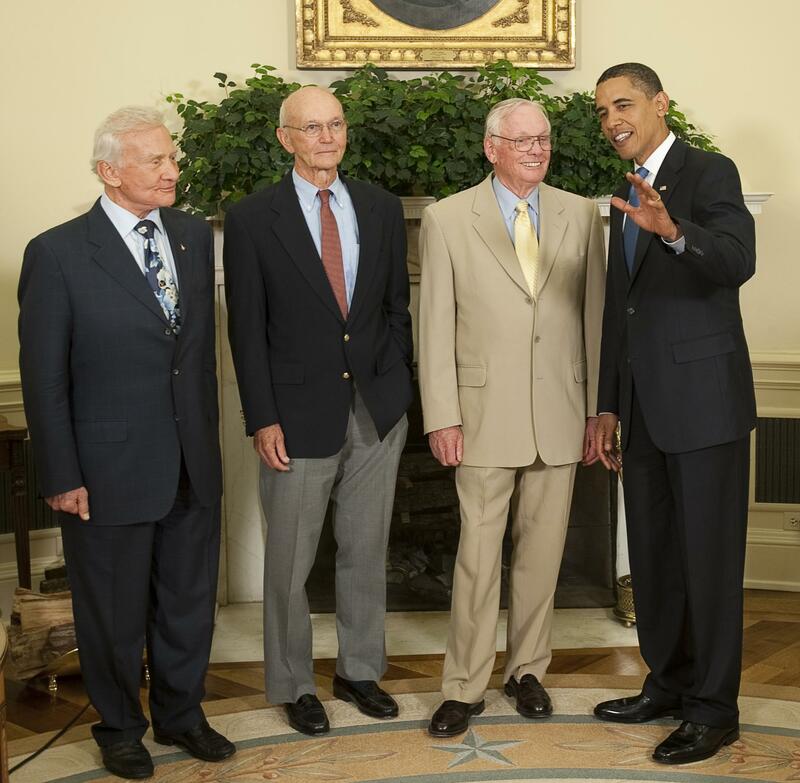 Unlike Buzz Aldrin, Neil Armstrong is normally rather taciturn and avoids the spotlight. This video of him his rather rare. Incidentally, a couple of you have enquired as to the whereabouts of my promised article on religion. Rather than e-mail each of you separately, I thought I would respond here. The fact is, I have the electronic equivalent of a large waste-paper basket full of scrunched-up pieces of paper. Having tried and discarded several approaches over the last few weeks, I have finally come to the conclusion that there is no way I can express what I want to in under 10,000 words, and even then is only the beginning of a summary. So instead of a single article, I’ve decided to start a series on Libertarianism and religion, the first instalment of which should be out in less than a week. We’ll try to keep a running conversation across this series, and tackle a different aspect in each instalment. I will do a dedicated thread on Islam (probably more than one), but a little bit later. So we’ll start the conversation sometime next week.